BH (S108) is a 65-year-old lady from Indonesia. An ultrasound of her pelvis showed her cervix was enlarged with a focal bulge over the posterior part. This bulge or mass measures about 23 x 12 mm. 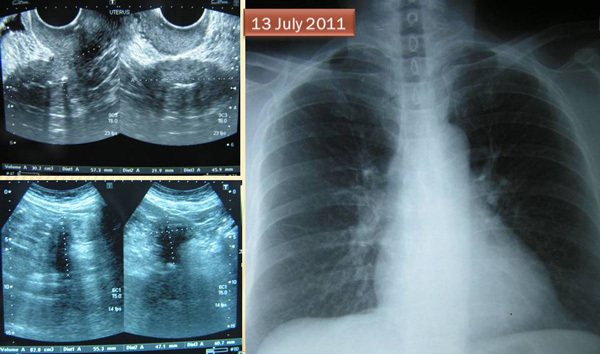 A chest X-ray on 13 July 2011 showed no significant abnormality see in the lungs and heart. A biopsy was performed on 14 July 2011 and confirmed malignant cells infiltrating deep into the cervical parenchyma. BH was referred to a cancer hospital for further management. A CT scan was done on 18 July 2011. It showed a bulky uterine cervix measuring 4.9 x 3.7 cm with a hypodense lesion seen within. This is in keeping with carcinoma of the cervix. 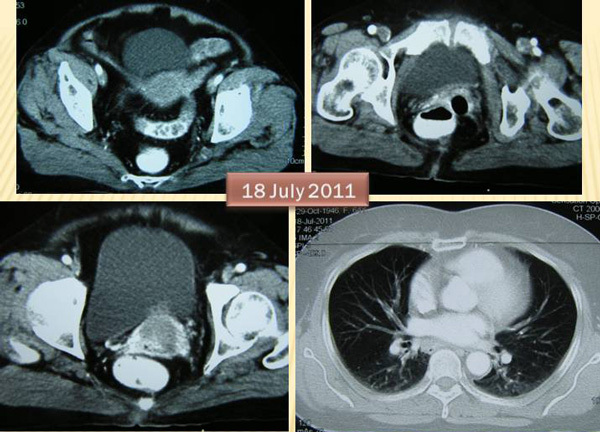 No metastatic disease is evident in the abdomen. BH underwent radiotherapy. She was told that there was a eighty-nine percent chance that she would be cured. BH had 25 sessions of external beam radiation and 3 sessions of brachytherapy (i.e. internal radiation). In addition BH received 2 cycles of chemotherapy. All treatments were completed by 12 October 2011. BH said she was well after the treatment. She came back for a check up on 25 November 2011 and was told everything was alright. She “believed” she was cured. Presence of retrocrural, hilar and mediastinal adenopathy in keeping with nodal disease. 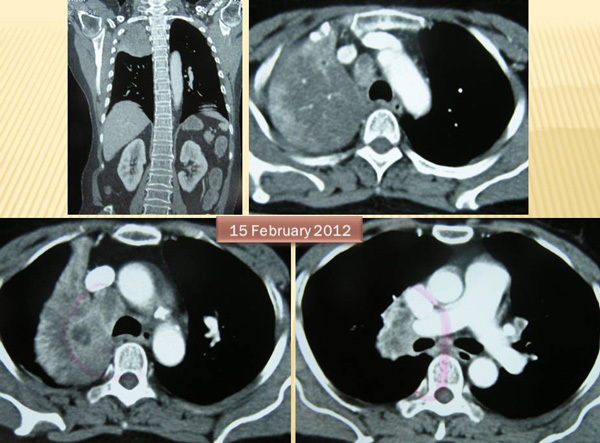 Collapse of her right upper lung, with a heterogeneous ill-defined mass lesion at the right pulmonary hilum approximately 4.6 cm, compressing the ascending bronchus and pulmonary artery. A 2.4 cm, irregular soft tissue lesion present in the superior lingual left lung, likely indicating metastasis. BH was asked to undergo more chemotherapy – 6 cycles and in addition 5 sessions of radiotherapy. She declined further medical treatment. She came to seek our help on 17 February 2012. Did you ask if this additional treatment is going to cure you? No guarantee to cure but the treatment might shrink the tumour. In July 2011, when you had your first treatment – radiotherapy and chemotherapy – did you ask if the treatment could cure you? For the first treatment, the doctor said there was 89 percent chance of cure. And she was “cured” after the treatment. How could you say she was cured when barely four months later the cancer had spread to her lungs? But the doctor said she was well after the first treatment! It was not a cure! My aunty’s cervical cancer recurred in her lungs 13 years after an apparent “successful” treatment. Did you suffer from your first chemo treatment? It was difficult. My head was pounding (bursting), my vision was blurred, I vomited (the night after the chemo). I don’t want any more chemo. Many patients went to see their oncologists and were given impressive statistics of success. Patients felt reassured (never mind if the promise did not turn out to be true). In this case BH was told that she had eighty-nine percent chance of cure after chemotherapy and radiotherapy. But the reality was, barely four months later the cancer struck back and went to her lungs. Do you ever wonder why the cancer had spread so fast? Before the treatment in July 2011 her lungs were clear – no sign of cancer at all. The message is simple – in cancer, nothing is certain. The only thing that is the uncertainty of the nature of cancer. It is unpredictable and anyone who promises you something good may not be able to keep that promise. When someone tells you — Your have 89 percent chance of cure – Do you really understand what he means? In this video the patient and his family believed that she was cured. She was alright for four months. Surely being well for four months does not mean cure at all. This case reminded me of another case of a lady from Kuantan. She came to CA Care on behalf of her 88-year old mother who had inoperable colon cancer (meaning the tumour was still in her colon). Her mother took herbs for just a month. Her CEA decreased from 19.9 to 17.3, CA 125 decreased from 37.4 to 20.9 but her CA 19.9 increased from 51.6 to 313.5. The daughter, (a bank manager) wrote: I just trusted the wrong DR quack. Another relative (brother?) wrote: How irresponsible a “doctor” you claimed to be. When patients come to CA Care we never promise anyone a cure at all – what if we were to say you have 89 percent chance of cure? What would you call such a person then? This entry was posted in Cervical Cancer, Lung Cancer, Medical treatments and tagged cervical cancer, chemotherapy, lung metastasis, radiotheraphy by CA Care. Bookmark the permalink.